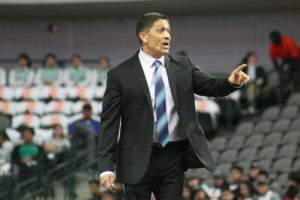 Craig Miller, chief of police for the Dallas Independent School District Police Department, had moments earlier finished addressing a crowd of 6,000 mostly students sprinkled with educators and administrators at the American Airlines Center in Dallas at a community outreach program involving the arena, school district, and IAVM, when he commented on just how essential and impressive the event was. That day, of course, was when a student at Santa Fe High School near Houston unleashed a volley of shots into a classroom that resulted in the deaths of 10 individuals and wounded several more. The student voluntarily surrendered and is in custody. Titled, SEE, SAY, DO SOMETHING, IAVM and Director of Education Mark Herrera brought together a diverse range of presenters from various backgrounds to share with students over the course of more than two hours the importance of boldly speaking up when anything is suspicious. It is a refrain that is common and certainly not novel, but a refrain that cannot be pushed enough at a time when data validates the troubled times that have plagued schools since Columbine on April 20, 1999. In fact, a show of hands in the crowd revealed that most were not even born when Columbine took place and know about it only by what they hear and read. Herrera noted that the United States holds the unwanted distinction of having the most active shooter events with 21 such incidents already recorded at schools in 2018. Chief Miller looked out at the sea of students that his department represents and implored their help. Chief Miller noted traveling to Parkland, Florida, 11 days after an attack on February 14 at the high school there in which 17 people were killed by a shooter. “You realize how personal this is now for people,” he said. Before addressing the crowd on the topic of Active Shooter – Making Prevention a Reality, John Skillestad, FBI Supervisory Special Agent, Office of Partner Engagement Violence Reduction Unit, Active Shooter Program, echoed much of Chief Miller’s theme. It is a cry that often ends up being acted out and has dire and often deadly consequences. Again, Skillestad cautioned against making blanket summations of individuals, even though cues and hints get dropped along the way by the perpetrator. Such was the case at Santa Fe where the killer proudly displayed a “Born to Kill” shirt on social media. “If this is something that he has never worn before to school or other behavior like that, then perhaps,” he said. “What we see is a lot of people will say, well, violent video games are the root cause of this. Well, how many kids play violent video games? Violent music where everybody listens to Marilyn Manson or whoever? Are they active shooters? No. It’s just part of the overall makeup of these individuals. What we believe they have is some type of deep-seeded angst for whatever reason. They were picked on, they felt slighted by not being chosen for an academic team or an athletic team. They just don’t feel like they are part of the community. Scott Breor, director, Protective Security Coordination Division with the Department of Homeland Security, leads a group that looks at the vulnerabilities within soft targets. Schools fall into that category. Breor said he really had just one main message to implore the students, and that is to get involved. Breor emphasized that while students can be eyes and ears, the professionals are on the scene for a reason. “Students don’t need to become security professionals but they need to get a level of awareness within the environment they are in,” he said. 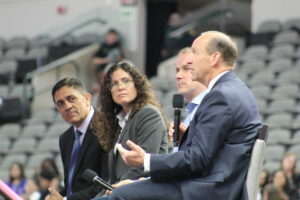 The spectrum of speakers also included Cheryl Shannon, Dallas County District Judge, who spoke about the consequences of words, Dr. Tamara Madensen, UNLV Professor of Crowd Dynamics, who spoke on that topic, and Bob Kolasky, DHS Deputy Assistant Secretary, Office of Infrastructure Protection. The school district was represented on a teen panel that included students Glenda Meyer, Molina High School, Alexandra Brooks, Woodrow Wilson High School, Reagan Ruffin, Skyline High School, and Lucky Lawhorn, Barack Obama Male Leadership Academy. The students took turns asking questions of another panel made up of some of the presenters. 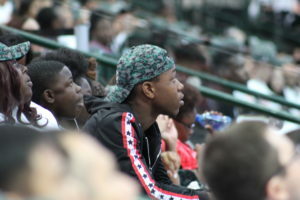 In addition to the education, students got to enjoy performances by dance teams of the Dallas Mavericks and Dallas Stars, while the drum lines from Bryan Adams High School and Carter High School energized the crowd. Breor noted that this rollout at an IAVM member venue is a great start and one that has potential for future growth throughout the country.